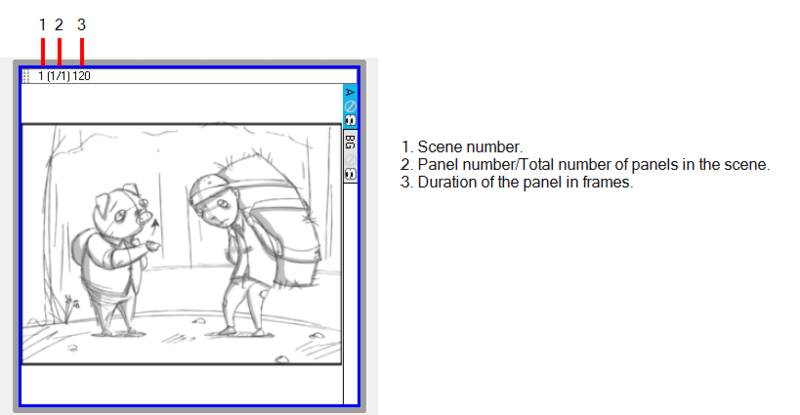 To build and organize your storyboard project, you will use panels, scenes, sequences, and acts. You have many options to customize these project elements in order to keep things clear and organized. • What are the Differences between Sequences, Scenes, Panels and Acts? What are the Differences between Sequences, Scenes, Panels and Acts? A panel represents an action and is the smallest element of the three. You should use multiple panels whenever you need more than one drawing to clearly express the acting within a scene. It is the white rectangle representing the camera view. By default the current panel will be highlighted in red in the Thumbnails view. A scene is composed of one or several panels. In animation, whenever the camera angle changes, you should create a new scene. In live action, this is called a shot.In other words, if your action goes from a mid shot to a close shot, each of these shot should be a different scene. 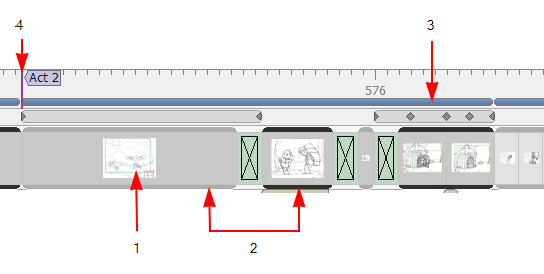 By default, a grey rectangle connects the different panels of a scene together. A sequence is a series of scenes that should be grouped together. Usually, scenes are grouped together by location. For example, all the scenes that are taking place in one location, should be in the same sequence and as soon as there is a change of location, it should be a new sequence. 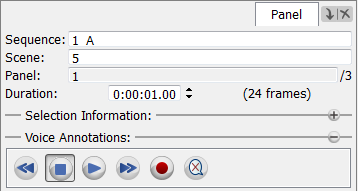 by default, a blue line connects the different scenes of a sequence together. An act is composed of one or several scenes and sequences. An act usually represents a story arc. It can be a certain time lapse in the story. For example, all the scenes in the first half of a TV series are one act, and the second act is after the commercial break. As for movies, live action, or even video games, there could have several different story arcs. In Storyboard Pro, a purple flag shows the beginning of a new act. In Storyboard Pro, you can easily create, import, rename, split and delete scenes. You can also create a scene that will appear before the current scene. ‣ Select Storyboard > New > New Scene Before. A new scene containing a blank panel is added before the current scene. A scene can be created from a selection of panels. 1. In the Thumbnails or Timeline view, select one or more consecutive panels. 2. Select Storyboard > New > New Scene from Selected Panels. The selected panels are joined together within the scene. You can select all the panels in a scene, using the Select All Panels in Scene command. In the Thumbnails or Timeline view, select one panel inside the scene you want to select all panels from. Select Edit > Select All Panels in Scene. You can import one or several images and have Storyboard Pro automatically create a new scene for each. Use this option if you have a series of bitmap images that you need to include, such as backgrounds or scanned storyboards. The supported image formats include: *.bmp, *.jpg, *.omf, *.opt, *.pal, *.png, *.psd, *.scan, *.sgi, *.tga, *.tif, *.tvg, and *.yuv. Select File > Import > Images as Scenes. The Choose Image Files browser opens. Browse to the desired images, select one or more images, and click Open. The images are imported and a new scene is created for one. NOTE: By default, when importing images in Storyboard Pro, the images are vectorized in colour and imported in vector layers. You can have access to more vectorization options by enabling the Display Vectorize Options Dialog preferences. Refer to Importing Images as Layers to learn more. When using the Import Images as Scenes function, you can save a little time by using the following naming convention for your bitmap images when you scan. Having your bitmap images named in the following manner, will allow acts, scenes, panels and layers to be created upon import into Storyboard Pro. ‣ Name: This is the name of the project. This string will not be inserted into the Storyboard Pro project, but it is mandatory. ‣ A: Indicates the act the image will be placed in. Replace the # with the number of the act. ‣ S: Indicates the first (or only) scene the image will be placed in. Replace the # with the number of the first scene this image will be used in. ‣ E: (Optional attribute) Use this attribute along with the S attribute if you want the image to be included in multiple scenes. Replace the # with the number of the last scene this image will be used in. ‣ P: (Optional attribute) This attribute is to indicate which panel the image will be placed in. Replace the # with the number of the panel in the scene. ‣ L: (Optional string) This string is to indicate the name of the layer where the image will be placed. Replace the # with the number of the layer in the scene. Select File> Import >Images as Scenes, and browse to the location on your computer where your images are saved. If you have one or more scenes that you need to remove, you can easily do so. In the Thumbnails view, select a scene to delete. If it is composed of more than one panels, select them all. You can also click on the minus sign in the top-left corner of the scene to collapse the scene as one panel and select it all as once. Select Edit > Delete Selected Panels/Transitions or press [Delete]. The selected scene is deleted from your storyboard. When a scene is deleted, or a new scene is inserted between two existing scenes, the numbering of the scenes will be out of order. By default, there is no automatic renaming of scenes. You can change this in the Preferences dialog box—see Preferencesand Renaming Scenes. When you start moving scenes and panels around, the Rename Scene dialog box automatically opens and prompts you to rename every time. You can also rename selected scenes as needed, using the Rename Scene command or the Panel view. This command lets you rename a selected scene, as well as all the other scenes following it to make sure they are in order. In the Thumbnails view, select a scene to rename. Select Storyboard > Rename Scene. The Rename Scene dialog box opens. In the New name field, type the new name for the selected scene. You can type either a number or a name. 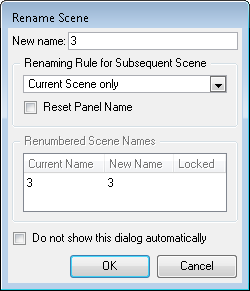 You can use the Renaming Rule for Subsequent Scene menu and determine if the next scenes should be renamed. The Renumbered Scene Names section displays the current and new names for all the scenes that will be affected by the renaming process. ‣ Current Scene Only: Renames only the selected scene. ‣ Renumber Scenes: Renumbers the current scene, as well as all the scenes that follow. ‣ Renumber Selected Scenes: Renumbers the first selected scene of a multiselection, as well as all the following scenes that are part of the multiselection. ‣ Renumber Prefix Only: Renumbers the scenes numerical prefixes beginning at the selected scene. The new name must be a numerical value. ‣ Renumber Subsequent Scenes in Current Sequence: Renames the selected scene, as well as all subsequent scenes in the same sequence. ‣ Renumber All Scenes in Current Sequence: Renames all the scenes contained in the selected sequence. 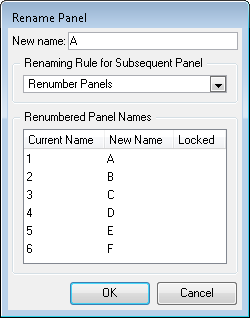 Select the Reset Panel Name option to reset all panel names according to the current panel time automatic increment rule—see Preferences section to learn how to define the auto-increment rule. You can rename scenes one at a time using the Panel view. In the Panel view, type the new name or number for your scene in the Scene field. A warning message appears if the name is invalid or already used by another scene. If this happens, it is recommended to use the rename command and rename all subsequent scenes. Select Storyboard > Unlock Sequence, Scene and Panel Names . Using Storyboard Pro, you can split the current scene in two or break it into three parts. By default, the preferences are set so that the Split Current Scene command divides the scene before the current panel. You can change this so that the same command breaks the scene into three parts by isolating the selected panel. In the Thumbnails view, select a scene to split. The current scene must contain two or more panels. The split will occur before the current panel. Select Storyboard > Split Current Scene. The scene is split into two scenes. In the Preferences dialox box, select the General tab, and then select the Break Scene when performing the “Split Current Scene” command option. In the Thumbnails view, select a scene to break. The current scene must contain two or more panels. The scene is divided in three. Your scenes should comprise as many panels as needed to show the actions taking place. With Storyboard Pro, you can easily create different panels for your project. You can also create a new panel before the current panel. Select Storyboard > Create Panel Before. A new panel is added before the current panel and inside the same scene. You can create a new panel that contains elements from another panel. In the Thumbnails view, select the panel that contains the elements you want to be duplicated into your new panel. In the Storyboard toolbar, click the Smart Add Panel button or select Storyboard > Smart Add Panel. Select the layers that contain material you want to copy into the new panel. Select the Add default layer if missing option to create the default layers of the new panel if they are not part of the Smart Add Panel selection list. By default, the rename panels option is locked. You must unlock this option in the Preferences dialog box before you can rename panels. In the Preferences dialog box, select the Naming tab. In the Panel section, select the Allow Custom Panel Names option. The Panel field in the Panel view can be now edited. In the Thumbnails view, select the panel you want to rename. In the Panel view, type a new name in the Panel field and press [Enter}. You can rename one or more panels simultaneously using the Rename Panel command. Select Storyboard > Rename Panel. The Rename Panel dialog box opens. Type a new name in the New name field. ‣ Current Panel Only: Renames only the selected panel. ‣ Renumber Panels: Renumbers the current panel, as well as all panels that follow. ‣ Renumber Selected Panels: Renumbers the first selected panel of a multiselection, as well as all following panels that are part of the multiselection. ‣ Renumber Prefix Only: Renumbers the panels’ numerical prefixes beginning at the selected scene. The new name must be a numerical value. The Renumbered Panel Names section displays a list of the panels that will be renamed, their old names and the new names. ‣ The Sequence, Scene and Panel fields become deactivated. ‣ Select Storyboard > Unlock Sequence, Scene and Panel Names. Once you start adding panels, you can also delete some. Note that it is impossible to have an empty project, there is a minimum of one panel. In the Thumbnails view, select one or more panels to delete. Edit > Delete Selected Panels/Transitions from the top menu or press [Delete]. The selected panels are deleted from your storyboard. You can duplicate panels when you need to create an exact copy of an already existing one. In the Thumbnails view, select the panel or range of panels to duplicate. Storyboard > Duplicate Selected Panels. The duplicated panels are added at the end of the current scene. If the selection included panels from different scenes, new scenes are created for them. You can easily move panels around in the Thumbnails and Timeline views using drag and drop. You can use drag and drop to reorder, separate or join selected panels. Joining selected panels will make them part of the same scene. In the Thumbnails or Timeline view, select one or more panels to move around. Click the header of the current panel and drag it to the new location. ‣ When you move your cursor around, a smaller version of the first selected panel with a number in it. The number represents how many panels are selected and being moved around. ‣ In the Thumbnails view, a straight blue line or a blue bracket represents what the movement will do. ‣ In the Timeline view, a green bracket or a green shape represents what the movement will do. To reorder panels in the Timeline view, drag and drop your selection when you see a green bracket or a green shape. You can drop your selection between two scenes or in the middle of a scene. Dropping a panel in the middle of a scene will include it in the scene, it will not split it. Remember that if you select more than one panel to move, you must drag them by clicking on the current panel in the selection. Clicking any other panels in the selection will deselect the rest. You can drag and drop a selection to remove it from a scene. Just drag the selection out and drop it between two scenes when you see a green rounded rectangle shape appearing. You can also use the top menu to join panels together. 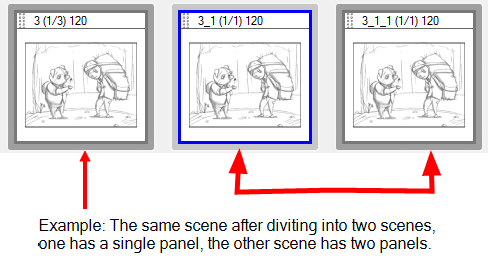 In the Thumbnails view, select two or more panels that are not part of the same scene. Select Storyboard > Join Selected Panels. The selected panels are joined in the same scene. It is possible to mark panels with a custom colour to manage them and to quickly be able to identify them. This option is also available for audio clips--refer to Sound to learn more about audio. NOTE: The default colour of panels is grey. However, you can change this value from the Preferences panel--refer to Preferences, in the Discovering the Interface chapter to learn how. A sequence is a particular section of the story composed by one or several scenes that has a unity in either time or its location. Scenes that are contained in different sequences can have the same name. Like scenes, panels, and acts, you can manipulate the sequences of your story while you are building your storyboard. 1. In the Thumbnails or Timeline view, select one or many scenes to combine as a sequence. Select Storyboard > New > New Sequence from Selection. Your selection becomes a new sequence. If this is the first sequence you add to your project, all scenes that are prior or next to it will be combined as sequences as well and the sequence markers will become visible in both the Thumbnails or Timeline views. If your selection was part of an already existing sequence, it will be split accordingly. NOTE: A single scene cannot be split into two or more different sequences, unless you split the scene prior to the operation. By default, new storyboard projects are created without sequence. You can change this, so that new projects are automatically created with a sequence. In the Preferences panel, click the General tab. You can select all the panels of a sequence at once, using the Select All Panels in Sequence command. Once you start adding sequences to your project, the Sequence field will become visible in the Panel view, allowing you to view the selected sequence's name as well as editing it. You can rename a selected sequence using either the Panel view or the Rename Sequence command. In the Panel view, type the new name or number for the selected sequence in the Sequence field and press Enter/Return. In the New name field, type the new name for the selected sequence. You can type either a number or a name. If you type a name or a number that is already used by another sequence, a warning message will appear. 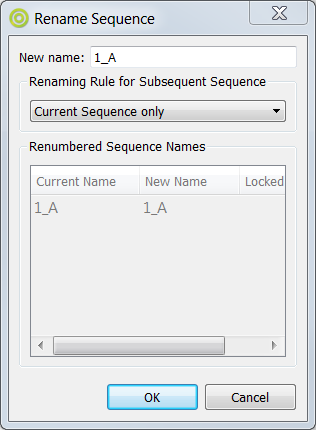 You can use the Renaming Rule for Subsequent Sequence menu to determine how the next sequences should be renamed. The Renumbered Sequence Names section displays the current and new names for all the sequences that will be affected by the renaming process. ‣ Current Sequence Only: Renames only the selected sequence. ‣ Renumber Sequences: Renumbers the current sequence, and the ones that follow. ‣ Renumber Selected Sequences: Renumbers the first selected sequence of a multiselection, as well as all the following sequences that are part of the multiselection. ‣ Renumber Prefix Only: Renumbers renumbers the sequence numerical prefixes beginning at the selected sequence. Note that the new name must be a numerical value. Two sequences can be joined together using the Join Selected Sequences command. 1. In the Thumbnails or Timeline view, select two consecutive sequences. Select Storyboard > Join Selected Sequences. The selected sequences are joined as one. A sequence can be split in two. 1. In the Thumbnails or Timeline view, select the scene before the sequence to be split. Select Storyboard > Split Current Sequence. The sequences in your project can all be removed at once. ‣ Select Storyboard > Remove All Sequences from Project. This clears all sequences in your project. An act is a particular section of the story delimited by a particular event or mood. • Act 1: The initial situation, character introduction. • Act 2: The journey. • Act 3: The resolution. Like scenes, panels and sequences, you can manipulate acts when building your storyboard. To add acts to your storyboard, you must first enable the option. By default, the acts are disabled, you need to enable them in the Preferences dialog box. In the Preferences panel, select the General tab. In the General section, select the Enable Acts option. A purple flag appears at the beginning of your project, defining the start of Act 1. Once you have enabled acts in your storyboard project, it indicates that your storyboard is made of a single long act. You need to break it in several smaller acts. To split your project into acts, you need to define the starting panel for each act in your story. ‣ Select Storyboard > Start New Act. Once an act has been split, it is possible to join acts at any time. In the Thumbnails view, select the last panel and first panel of the acts you want to join. You can also join more than two sections by selecting the last panel of the first section until the first panel of the last section you want to join. ‣ Right-click the selected panel and select Join Selected Acts. You can select all the panels of an act simultaneously. In the Thumbnails or Timeline view, select a panel contained in the act in which you want to select all the panels. Select Edit > Select All Panels in Act.